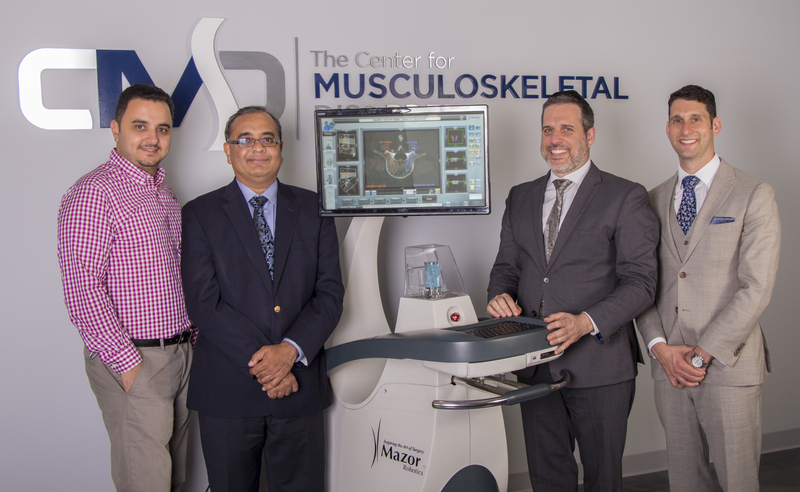 ENGLEWOOD, NEW JERSEY (September 27, 2016) – The Center for Musculoskeletal Disorders (CMD) is proud to announce it has acquired a robotic surgery system from Mazor Robotics, making CMD the first independent private practice in the northeast to do so. The “robot” is used to assist surgeons in various spine procedures, including kyphoplasty, spinal fusion, minimally invasive surgery, scoliosis surgery, biopsy, adult reconstructive surgery and vertebroplasty. As a leading innovator in spine surgery, Mazor Robotics developed its Renaissance® Guidance System to revolutionize the patient and surgeon experience. Its benefits to patients are well-documented and include reduced post-operative pain, quicker recovery time and lowered complication rates. With a robotics system, surgeons also gain the benefits of reduced fluoroscopy (significantly lowering radiation exposure for patients and operating staff) in addition to increased accuracy and improved patient outcomes. At CMD, we are continually keeping abreast of the latest developments to benefit our patients. New technology requires surgical education. To that end, our spine surgeons Dr. Jonathan Lewin, Dr. Seth Grossman and Dr. Vagmin Vora, along with our PA, Isaac Abramchayev, are specially trained in performing robotic spine surgery. Dr. Steven Horowitz and Dr. Jonathan Simhaee of The Center for Pain Management will be integrated into the robotics platform as well. The Center for Musculoskeletal Disorders (CMD) is a New York and New Jersey formalized joint practice including The Center for Spinal Disorders, The Center for Hand Disorders and The Center for Pain Management. CMD provides a full range of diagnostic and treatment services in each of its disciplines. CMD’s specialty-trained physicians and staff share the common philosophy of highly personalized care. They stress non-surgical solutions whenever possible and use cutting-edge medical and surgical techniques to customize advanced treatments for their patients’ needs.